According to research carried out by the National Highway Traffic Safety Administration, it seems that fewer children died last year in roadway crashes. Yet, the Department of Transportation (DOT) is cautioning parents and caregivers alike to retain the use of child safety seats or booster seats. The data for child fatality point out that the leading cause of child death was vehicle crashes. From ages between three and fourteen, young children lost their lives and up to 490 were injured each day in 2009. It is a known fact that child safety seats saves lives and parents and caregivers are encouraged to use this safety measure. Avoid graduating too quickly to booster seats or passenger belts, until the child is able to fit properly in both. Once your child outgrows their child safety seat, fit them into a booster seat which is the next level of vehicle safety precaution. 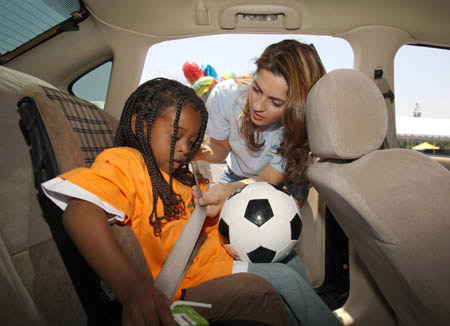 Avoid fitting a child to a passenger belt until it fits properly, usually at the age of eight. It is better to remain in a booster seat until the passenger belt fits the child, resulting in fewer roadway deaths and injuries. Leave no room for mistakes when it comes to the safety of the child every time, on every trip. As someone who works for a n online traffic school, I’m well aware of the significance of not leaving child safety measures to chance. Although we always try to drive home the importance of safe driving here on our comedy traffic school website, child safety is number one!